I increasingly hear quite a lot of the latest buzz about this map and that map but where is this noise coming from? Anyone who knows anything about mapping will immediately spot two glaring issues...the data are not normalised and the colour scheme is truly unhelpful in allowing readers to rapidly see the patterns. Here's a version I made...it's not particularly attention-grabbing but it's constructed with basic principles in mind so we are better able to see the patterns. Not only are the patterns modified when you normalize so they can be properly compared against one another against a constant baseline measure but light to dark means less to more. I'm afraid spectral colours aren't read like that by humans - we see 'difference', not 'quantity' so although in the first example I can tell Australia has a different count to China and Norway...I don't know in which order. Purple 'looks' more than light blue (because it's darker) but if you look at the legend China has more medals. But once normalized, actually they have no more per capita than Australia meaning that they are pretty much equally successful. Sure, China gets more medals overall but then have a massive population by comparison so you'd expect more medals. We normalize to allow us to visually compare like for like. And are the USA really as good as the top map suggests being in the next to top class? 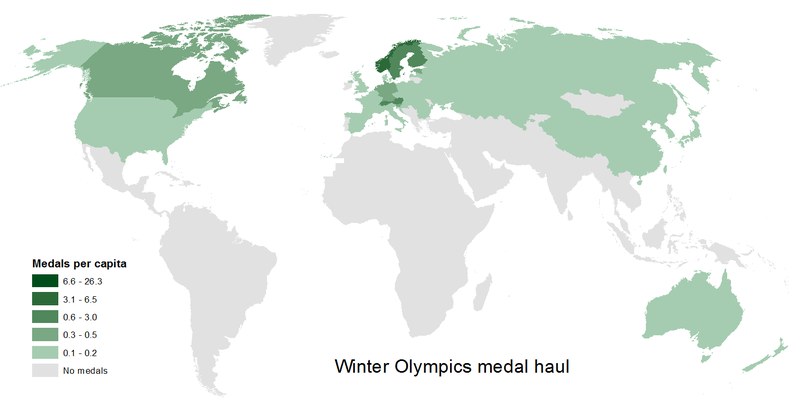 No...given their population, actually their winter medal haul is relatively poor and on a par with the UK per capita. So, back to the point...is the daily consumption of bad maps bad for you? I would say yes because you're getting the wrong message. It's a waste of map calories. I'm all for quick and dirty maps made well...but not ones that are constructed shambolically and peddled to us by people who know no difference. I mentioned this myself on Twitter a while ago and someone said to me that while they agree, they like fine restaurants but also dive into Subway on occasion. I've used the food analogy before but I think it needs to be more subtle here. Sure...go to a Heston Blumenthal restaurant and enjoy fine dining. Go to Subway and enjoy a sandwich too. Both different 'qualities' of food in all likelihood. However...would you want to go into Subway and order a meatball sub that comes with the meatball on the outside, trying desperately to envelop some bread? At least Subway construct their sandwiches according to the basic rules. Bread on the outside, filling in the middle so it works on a basic level as a sandwich even though it might taste like crap (taste, of course, is a different argument altogether). That, for me, is the problem with a lot of maps...they suffer from basic constructional issues that really affects their performance as maps. Yet the appetite is there because the 124,000 Twitter followers that @Amazingmaps has dwarfs the combined Twitter following of at least 50 of my map expert friends combined by some margin. Tabloid newspapers have higher circulations than quality broadsheets. The reporting is dubious. Same with maps...it's just that maps have in the last 10 years suddenly entered this realm of ubiquity so now we have professional cartographers along with good map-makers and not-so-good map makers and who cares who makes the map, how it's made or if it's any good because it all sells. No-one seems particularly bothered who made the map and what their cartographic qualifications are when they peddle maps they find on the internet yet I would strongly argue that being authoritative in your domain is crucial in distinguishing quality work from the masses. It's therefore not the fault of the makers of map-making tools or the map-makers themselves that we see so many poor maps. Just like any service based on mass consumption, if the demand is there, there will be someone keen to feed it regardless of the quality. The demand is for maps, good, bad, big, small, whatever. There are plenty of people and organisations that have set themselves up in the last few years to satiate the demand purely to serve their own agenda of being purveyors of content. How many of these have any real cartographic credibility? Take a look...you won't find many publicly visible examples that have a strong cartographic background. Such sites are not curated by people who know anything about maps. That much is obvious. Over at the International Cartographic Association blog we're trying to arrest this by providing a quality broadsheet version of Amazing Maps, set up as an antidote to tabloid cartography. I'd love you to go take a look and share the links if you care. We're running a daily series called 'MapCarte' where we're showcasing a curated map that evidences high quality classic and contemporary cartography. Beautiful maps, made well and described to explain something of why the map is regarded highly. Maybe the Twitter handle @AmazinglyBadMaps was taken? In truth what they're peddling is potentially interesting data mapped poorly. It's like Del Boy's paint...perfectly decent paint but painting a Chinese restaurant in British Rail luminous yellow just doesn't work. If you prefer eating at a decent restaurant rather than Del Boy's painted Golden Lotus then head over to MapCarte and gorge yourself. Maps can be described in many ways as I explored briefly in a previous blog. Historically, they can be categorized into three general types based on their function, scale or type. In terms of function, a map might be termed reference if their function is to provide information about the character of a place, its general topography and the way in which the landscape is modified through human use. The detail was carefully managed to ensure a consistent design at a particular scale which resulted in often difficult choices for what to include or omit. Similarly, the term thematic often describes the function of a map in communicating something about a specific, often narrow theme. Alternatively, scale itself may be used as a taxonomy since small scale maps tend to share similar characteristics (highly generalized, country level) as do large scale maps that show detail of localities. The third main way of classifying maps considers their unique type such as choropleth, topographic map, aeronautical chart or cadastral plan. Of course, there is overlap and there are outliers to this approach such as mental maps that exist in our minds to support knowledge of a place, navigation or wayfinding and so on. But the traditional three-way classification is now challenged as technology changes the way maps are designed and produced. Maps are now more fluid in their purpose and more flexible in the way we consume them so the overlaps have become more profound. If we consider how the web has changed the way we consume maps we can see how the map itself has adapted and no longer fits into the traditional classification. Maps are now available as a mass consumption service through our web browsers and mobile devices. We no longer need to go to authoritative national mapping agencies for our mapping needs; instead we use maps supplied by search engine providers, news agencies and a plethora of organisations. Maps are made by everyone and consumed in many more ways. A reference map may now be comprised of multiple layers that, viewed in a web browser can be selected or deselected. The map may rely on a basemap built and designed by someone else and consumed as part of a suite of layers of information. As such, that clear cartographic approach to ensuring different types of information sit neatly together is not necessarily the primary objective. If users of the map can switch between layers to highlight the reference layer of particular interest then, functionally, the map retains its core purpose yet it achieves it in a different way. The user experience of map consumption has changed and that requires a change in mindset concerning how we think of the map as a type. We now also use reference maps as base layers for other information. More commonly called the ‘mashup’, the use of third party basemaps atop of which we add thematic content is becoming a common approach in contemporary mapping. the purist may suggest the basemap might be unsuitable but with more options available (such as neutral, decluttered basemaps) and the ability to modify the content and colour of map services to support your intended design, increasingly the ability is there to mashup thematic content on suitably modified basemaps. Here then, is a hybrid approach to making a map as we eschew basic outlines commonly used for thematic mapping in favour of a basemap that incorporates some geographical context (which itself may be modified to select/deselect certain features or modify the symbology to be sympathetic to a particular thematic overlay. This, of course, benefits thematic mapping by providing a language-based way of helping us describe and interpret the patterns that our thematics show us since we can more easily relate them to places we are familiar with. Individual map types now no longer characterize maps as well as they once did. Where once we saw a single choropleth map and the map type was obvious, we now see layers of different map types presented in interesting and interactive ways with the potential addition of multimedia and other information graphics. I like to call these info-maps, though in truth maps have always been a conduit for imparting information but most seem to have forgotten that and prefer, instead, to make up ever more intriguing terms to replace the otherwise perfect description - map. Perhaps due to the increasing ease of production and the ability to pour data, pictures, video, text etc into a template, the map is now not the central focus of the work but merely a mechanism and a pipeline to the real crux of what map-making is all about - telling a story. Telling stories (actually, communicating information) is the focus. Again it always has been for cartographers. The story is the focus and the map is a component of the story, albeit one that deserves a central part and which is designed in sympathy to the message. Here then, thematic maps and discrete map types are being used inventively and interchangeably by people as they search for compelling ways to present their work. The clear distinction of a map based on type (because of its character) is no longer adequate as a way of differentiating. In terms of map type, then, it’s possibly even more difficult to create a neat taxonomy by which we can describe and identify maps. The process of technological change, the mechanism for design and production and the explosion of people now making maps means the distinctions have become further blurred. Where once maps used to be made by standard photo-mechanical processes we then saw a move to desktop based design and production. This remains but has also been augmented by coded solutions, web-based approaches, maps as services and APIs. Map consumption has changed too, driving the demand for maps available on the web and mobile devices. This in turn drives development of mapping technologies and the further proliferation of map making. These have changed both the process and result of mapping endeavor yet they exist in parallel and in many ways are complimentary rather than being replacements of former technologies. Reference maps: characterized predominantly by their function. These support general tasks of locating oneself, navigating, finding where things are and understanding the natural world and patterns of human use. These maps include those produced by national mapping agencies and the multitude of digital basemaps provided online. They might exist in paper form or digital form and can combine imagery with vector graphics and, additionally, commercially provided, paid for or personalised content. These will most often be produced by large organisations (though not necessarily mapping organisations) and require significant investment in time and development as well as comprehensive data. Multiscale maps: characterized predominantly by an online delivery. These maps may have varying functions yet in common they offer the user a way to explore a theme at different scales, each one working in harmony with the next zoom level. Such maps may be entirely reference-based or thematic but will commonly integrate the two and reveal more detail at larger scales. Such maps will likely use a reference map provided as a service and pay most attention to the overlayed detail. In many ways this category has replaced that which uses scale as a differentiating characteristic though, of course, scale remains a key factor in cartographic design. Thematic Info-maps: characterized predominantly by the integration of a range of media to present a rich, information product. The map will play a central role but will be augmented by graphs, graphics, pictures, animation, interaction etc. These maps may make fundamental use of new web technologies as a way of augmenting the map experience or may be the sort of high quality work associated with good journalistic cartography. They will often integrate a range of technologies using desktop, services and coded solutions to create bespoke products, often animated. Interaction is a key priority for such maps be it physically through a User Interface or through exploration of detailed information. View the map full screen (with interaction and animation) here. Ephemeral maps: characterized predominantly by simple, often linear, maps that offer an insight into a single topic with very clear boundaries, for instance the delivery of a set of images of a theme using map markers to show their location. Such maps will often be easily produced and delivered in pre-configured templates and be capable of being produced by many more people than the above categories due to the lower threshold of user knowledge/skill required. Here, the map-making process is as much a consumption service as users are encouraged to make use of pre-configured off-the-shelf mapping solutions. Such maps are inevitably short-lived. Map making and the map product have changed dramatically. Technologies now support a rich variety of possibilities, bringing the process of map-making to more people. The entry level to making a map now has a lower threshold. Quick, dirty and often transient maps are rapidly produced and quickly forgotten yet these add to the cartographic canon of work and possibilities and potentially create a new and developing class in our taxonomy. The traditional way of describing maps by function, scale or type has been fundamentally blurred as the milieu of mapping becomes increasingly varied affording more opportunities, more capabilities and more flexibility in almost every aspect of the design and production process. Are these new categories I propose different...or possibly just an updated description to take account of the changing map-making landscape? Disclaimer: with the exception of the National Geographic basemap the maps illustrated herein are mine. I don't propose them as exemplar products, merely an illustration of type. Clearly the fact this blog is delivered digitally means the delivery mechanism is fixed. This illustrates the overlap between categories, whether old or as I've modified.